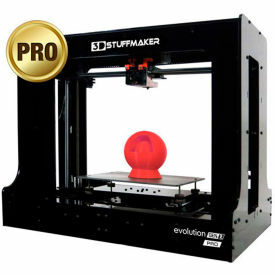 The Evolution Gen 2 Pro is a professional grade 3D printer for designed for engineers, innovators and serious makers. Its large print plate allows for large print volumes. The PRO version is assembled and calibrated in the USA with fine-tuned modifications that allow for quality 3D printing and easy setup. Advanced tools & customization: Personalize the Evolution Gen2 by tweaking, modifying or calibrating. QuickChange connector for easy extruder exchange and maintenance. 3D Cooling Kit: Improved tolerance to filament variance, extended print times, improved extrusion accuracy for better printing of solid and complex objects. Quick Change Nozzle: Quick Change connector for fast and easy nozzle replacement and maintenance. Print Plate: Heavy duty aluminum, resistant to warping, continuous operation, easy removal and placement. Simple, powerful and intuitive software interface. Plug & Print: Preloaded configurations make setting up your desktop 3D printer a snap. Organize, search and manage your library of 3D printable designs. Advanced tools: Just because it's easy to use doesn't mean you can't tweak, modify, and calibrate to your heart's desire.